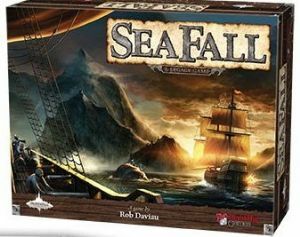 SeaFall is a ‘Legacy’ board game designed by board game industry veteran Rob Daviau. A Legacy game is a concept developed by Rob. The idea behind a Legacy game is that the game ‘remembers’. As players play a Legacy game, the game board changes, cards are modified and sealed packs are opened revealing twists and turns in an epic storyline. Players will watch as their actions have permanent effects on the game world.